European Central Bank President Mario Draghi reiterated his call for reforms and also confirmed his readiness to extend monetary stimulus. The reaction in the currency market was swift, with the euro resuming its slump versus the US dollar and ending the session 46 points lower at $1.2691. Can the newly declared worry of the Fed regarding the next step for economic growth balance the act on the euro-dollar front? Minutes from the last Federal Open Market Committee meeting showed a reluctance to raise interest rates; an opinion that was at odds with the market's hawkish expectation. This deferred speculation about the timing of a rate hike and delivered further blows to the dollar. Enjoying this mini recovery, the EUR/USD pair rose for the third straight session, gaining 65 points to $1.2734 ahead of a speech by ECB President Mario Draghi in Washington later today. German industrial production shrank by the most in 5 years, disappointing markets and triggering a plunge in the DAX and other European indices. After rallying sharply the day before, the shared currency gained just 17 points against the dollar to $1.2669 and even went into reverse during overnight trading. Germany, the powerhouse of Europe, showed signs of weakness yesterday as factory orders declined by more than estimated. However, bargain hunters helped the shared currency post a sharp rebound following Friday's significant sell off against the dollar, pushing the EUR/USD CFD market 141 points higher to $1.2654. Encouraging figures from the US fuelled speculation that the Federal Reserve is getting closer to raising interest rates in 2015. In contrast, Eurozone inflation slowed to a 5 year low, increasing calls for the ECB to ease policy. 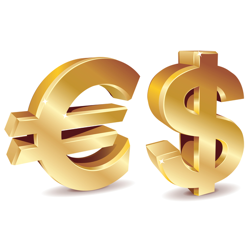 This policy divergence continues to support the dollar against the shared currency, with the EUR/USD pair resuming its slump on Friday, losing 157 points to $1.2511.